ICatholic Release: Cleveland, Ohio native and longtime priest of the RomanCatholic Diocese of Salt Lake City, Utah, Monsignor VictorG. Bonnell, died on February 23, 2018 at Jenning’s Catholic Nursing Home, Garfiled Heights, Ohio, following a longillness. Following his Utah retirement on June 19, 2011, here turned to Cleveland to be closer to family members. While there he continued to do weekend ministry atvarious parishes. Monsignor Bonnell was born June 19, 1928 in Cleveland ofMichael A. Bonnell and Bertha Levandusky Bonnell. He issurvived by family members he dearly loved. Monsignor attended Saint Philomena Grade School and Cathedral Latin High School in Cleveland and received his undergraduate degree from John Carroll University. He served in the Army from 1951-1953 in Hawaii, Korea and Oklahoma. After receiving a Master's Degree in American History at Georgetown University, Washington, D.C., he entered Saint Mary's Seminary, Baltimore, Maryland for the study of theology. Following his ordination as a priest for the Diocese of Salt Lake City on May 28, 1960 in the Cathedral ofSaint John The Evangelist in Cleveland, Ohio, Monsignor Bonnell traveled to Salt Lake City where he began his ministry as assistant pastor at Our Lady of Lourdes Parish from 1960-1966, where he oversaw construction of the new elementary school. He then served Eastern Utah as pastor of Saint James the Greater Parish in Vernal from 1966-1971 and Saint Mary's Parish in Park City from 1971-1972. In 1972 Monsignor was named founding pastor of Saint Peter and Paul Parish in West Valley City, where he oversaw fundraising and construction of the new rectory and parish center. Following that he served from 1983-1988 as chaplain at the Utah State Prison, Salt Lake County Jail and two youth correctional Institutions where he confirmed his reputation as an exemplary priest who provided outstanding pastoral care. In 1989 Monsignor accepted the difficult task of replacing the Paulist Fathers at Saint Rose of Lima Parish in Layton. There he relocated the parish plant at a new site and began construction of the facilities. He served there twenty-two and a half years, during which time he raised millions of dollars to build a modern church complex with its education center. During this time Monsignor also served as Northern Utah Dean, Diocesan Consultor, on the Priest's Personnel Board and other committees. He was active in ecumenical affairs. Heserved us the Spiritual Director of the Legion of Mary Curia and Chaplain of the Swords. In 2001, Monsignor was a named Prelate of Honor by Pope John Paul II, in recognition of his outstandingservice to the Catholic Church. Monsignor was also a Fourth Degree Knight of Columbus. 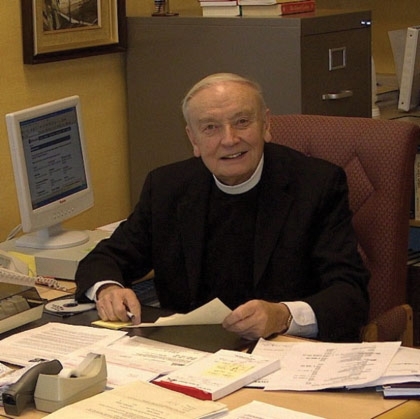 Monsignor Bonnell was a person of integrity who lived by the high standards he expected of others. He waswell read, worked hard, and focused on serving the diverse pastoral needs of his parishioners. Few of hiscontemporaries had the financial expertise or talent for construction that were his special gifts. At his golden jubilee celebration as a priest in 2010, family and friends spoke of their love for him. They knewMonsignor as a faithful priest who could change with the times yet always observed the traditions of theCatholic Faith. They knew him to be generous, humorous, hardworking and compassionate. His commitment to the priesthood was his life. May the resurrection Monsignor preached be his. May he rest in peace.